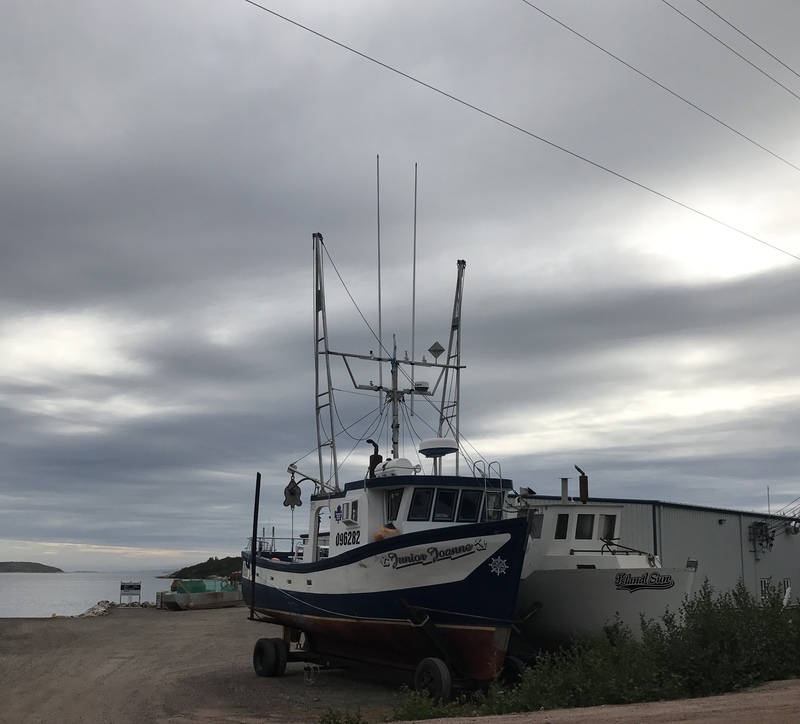 Two weeks, one continuous road on the ONLY HIGHWAY in Labrador, and 7 days along the southern coast – I came to know a little bit about this vast Province. 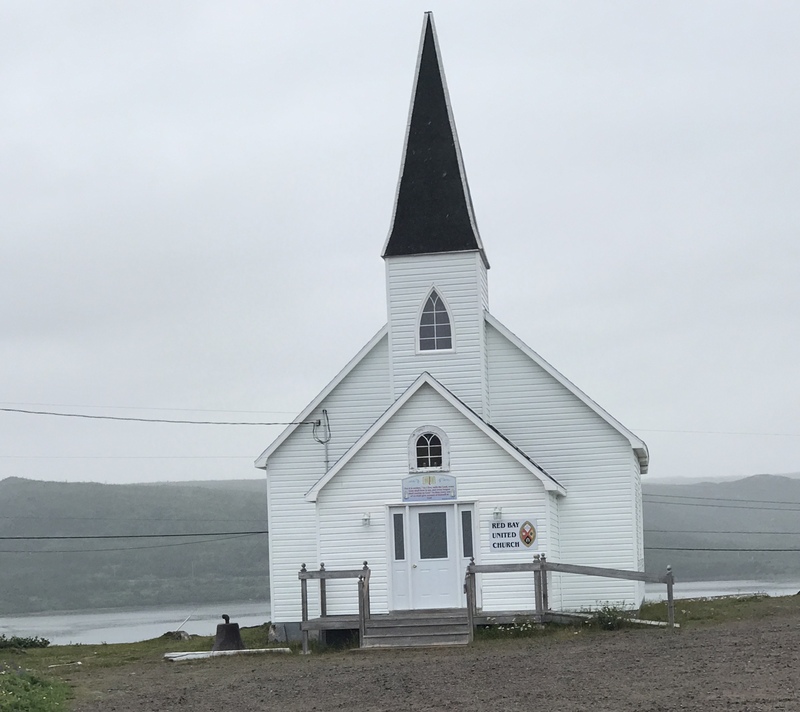 People kept telling me, “come back in the winter, that is when you are able to see Labrador’s interior.” Dog sledding, snow mobiles, eight-foot ice walls leading to store fronts, which have mud rooms inside the entrance – oh yes, I will rush into that experience! Dog sledding I would love to do though, and meet Missy. The Labrador Husky is native to coastal Labrador. 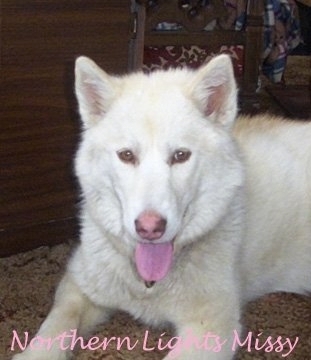 It belongs to the northern group of dogs, which include the Siberian Husky, Samoyed, Alaskan Malamute and Canadian Eskimo Dog. The breed was most likely brought to Labrador by the Thule Inuit around 1300 AD. 60 of these purebreds are in existence now. 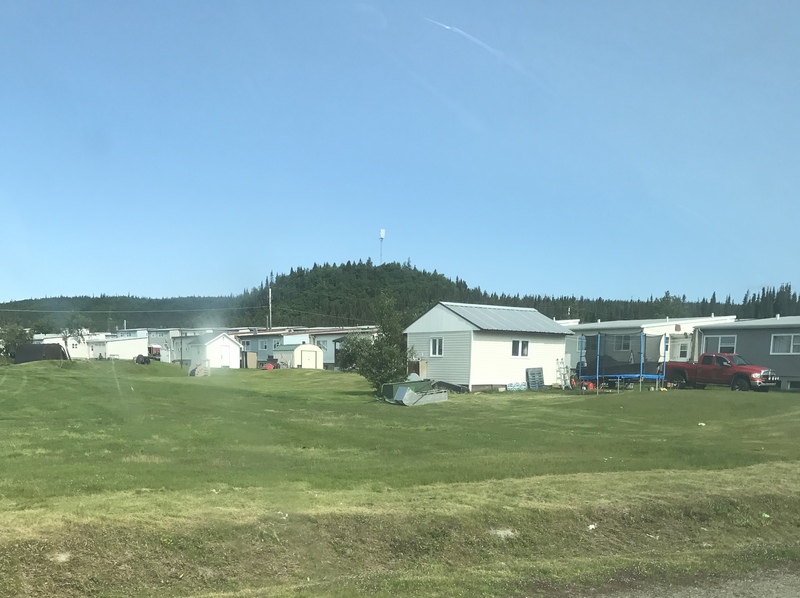 I left Labrador City and continued on the 1 (one) road, Trans Labrador Highway, 774 miles of which 50% was undergoing some type of construction through Labrador. There were three side roads none longer than 20 miles going to three towns: Cartwright, Fort Lewis and North West River. 200,000 sq. miles with a 30,000 population which translates to a lot of square miles per person. I can’t quite visualize this, but, with only 3 major towns comprising most of the population that leaves a huge unpopulated land mass. 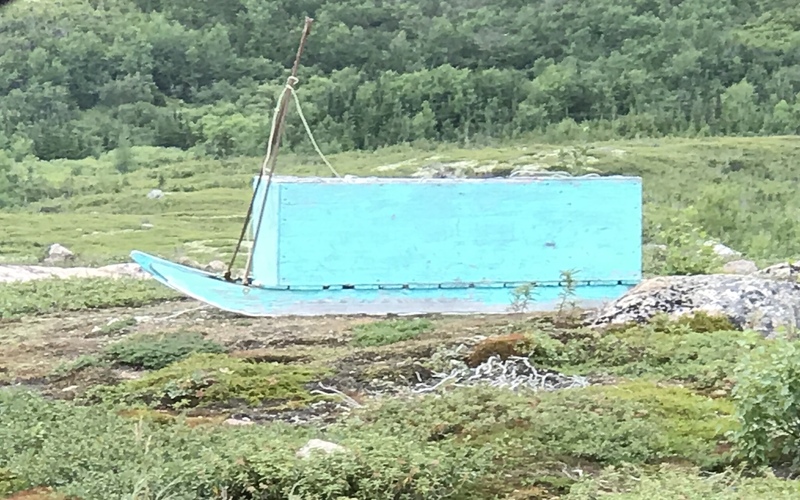 Throughout Labrador, most First Nation villages are only accessible by plane or boat during the summer and only by plane during the winter. I mean to tell you, these people are self-sufficient! I drove from Lab. City to Churchill Falls, which is an hydro-electric town and has the second largest hydro-electric generating station in Canada. It reminded me of the man-made towns in China: towns built for a specific purpose and people moved in to occupy the buildings and work for the company. 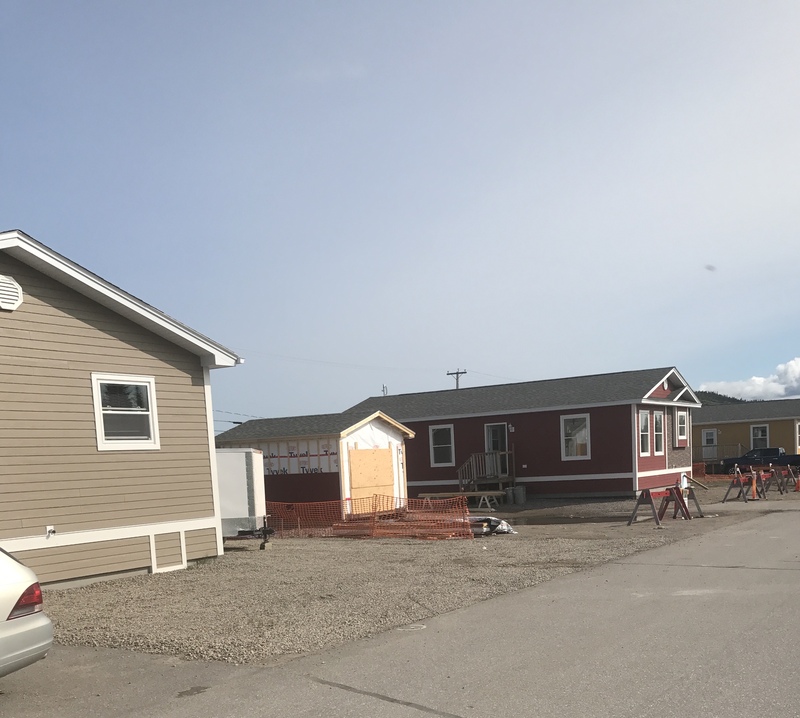 There were houses, a store and a gas station. No rent is charged, cannot buy a house, and if an employee quits or is terminated, the house is no longer available. No retirement nor pension is available. I drove through, got gas and kept moving onto Goose Bay. Just a side note: Phillipinos have immigrated to Labrador because of the high wages for service jobs. They send money to their families back home. And.. on to the southern coast of Labrador. 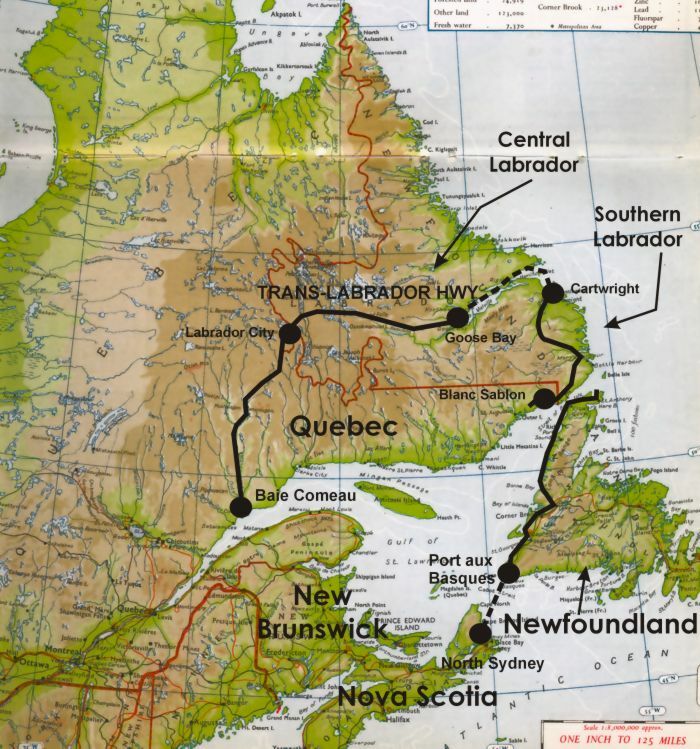 Since there were few campgrounds in Labrador, I parked behind a Visitor Center, at a rest stop, at a road construction site and on a side road that led to ???? 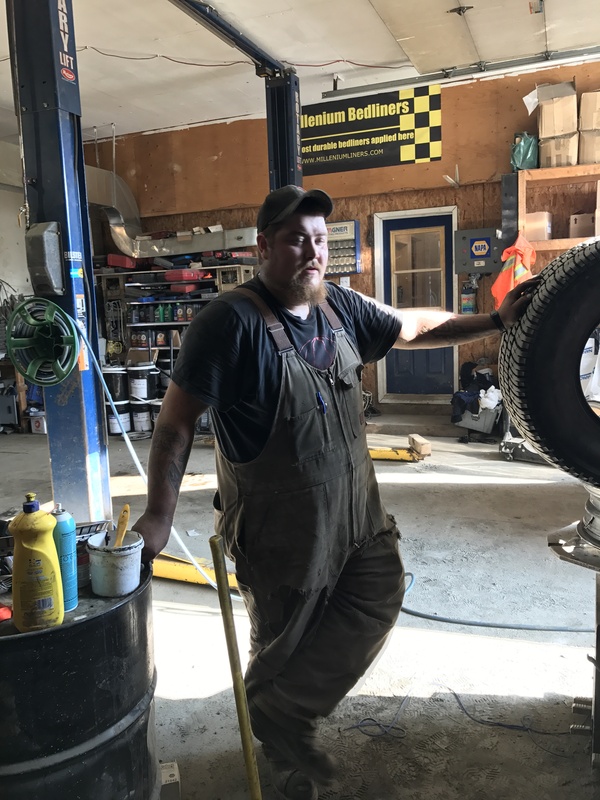 Ronnie, in Port Hope Simpson, southern Labrador, fixed my flat tire. 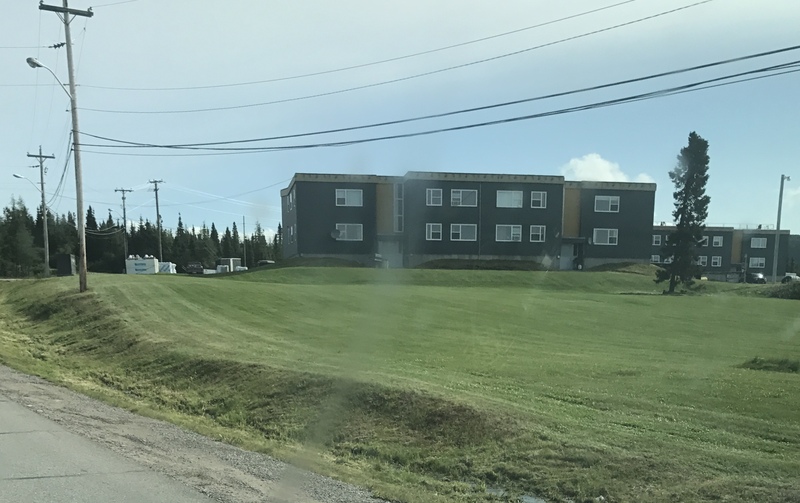 which had been punctured by a piece of steel from the rock crusher machine building the Trans-Labrador Highway. Without a doubt, the absolute worst road I have ever travelled. It gave new meaning to the word “washboard.” The solar panels on Mabel became dislodged and do not work, the built- in navigation system was knocked out of the dashboard, and my 265 Michelin truck tire received a piece of steel not willingly but firmly implanted. Ronnie, a true Labradorian, repaired the with a plug, checked for more leaks with soap and water, and sealed it. It reminded me of living on the ranch – you don’t replace, you fix! He also checked the other tires of which one lost 20 psi on that road and sent me on my way for $25 Canadian dollars and a smile with a recommendation to get a moose steak at the restaurant! 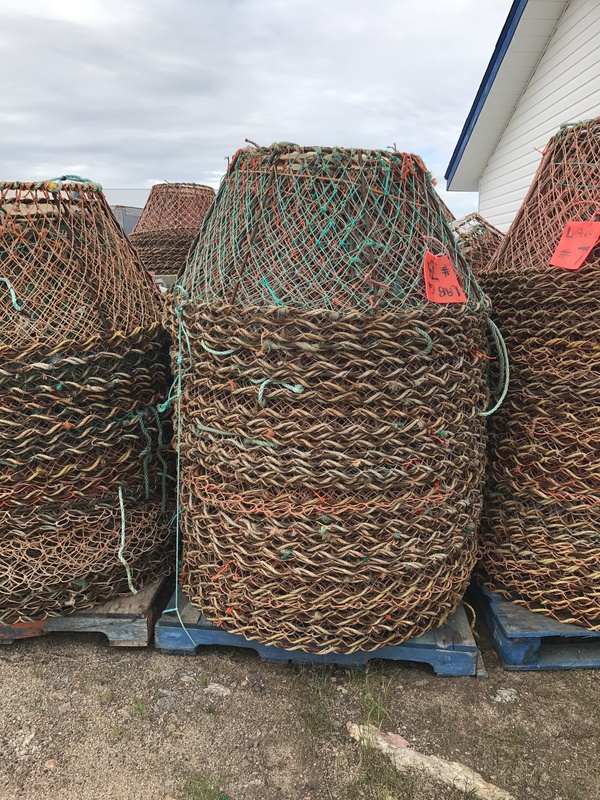 Ahh — Southern Labrador Coast… houses clustered on the coast; hand woven fishing baskets set by boats and cottages, cottages built to store winter wood; old Inuit sleds scattered on hillsides to haul wood to villages. I loved the Coast! Each little town separated by anywhere from 2 to 7 miles had a particular service to offer: get your tire fixed here, get your groceries here, get furnishing here, etc. While I was waiting for the oil to be changed and sipping some coffee at the adjacent grocery store, I heard, “See that woman? 94 years old she is and every day she walks by – 3 miles she does.” There is a camaraderie of survival and independence. 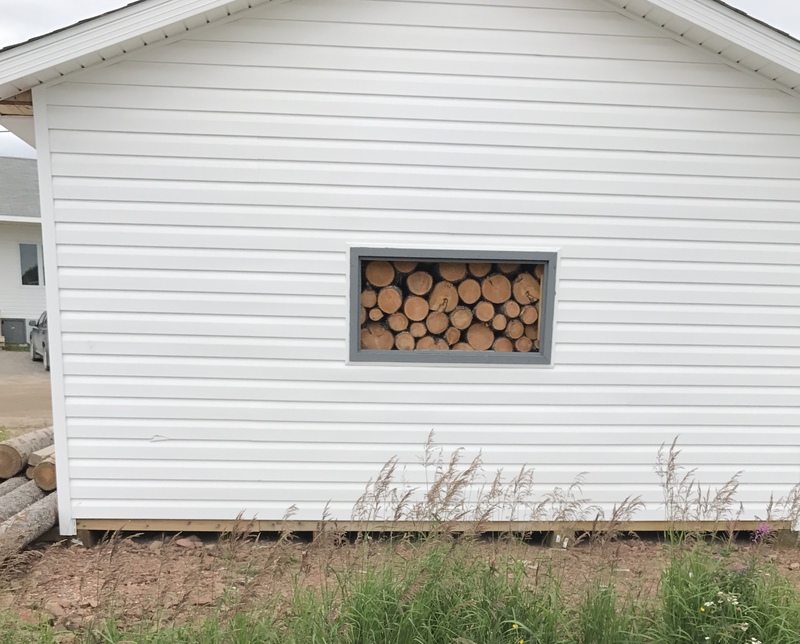 By day seven, although I was at a Provincial Park, I was ready to leave. I woke up with ice on the windshield and headed to the ferry dock. Lucky and grateful is how I describe my time in this vast land. With this Trans Labrador Highway being built and the ensuing accessibility of towns, a part of Labrador’s culture will be forever gone. The naiveté and the welcoming smiles might be replaced with suspicion and “Oh Christ, here’s another tourist.” I hope not. So, Mabel, Alice and I loaded on the Apollo Ferry from San Blanc and as the dock worker said, ” Are you ready to load and go, ma’am?” You bet! We continue to explore and learn. What an experience – when we were up that way we also went to Prince Edward Island; beautiful agricultural area. I have to hand it to you changing your own flat tire – or did you make it to town before it went flat. Good luck and fun travels. What an adventure…I wish I was as fearless as you are Lisa. MIssing you but know you are doing what you enjoy. Think about you all so much, Paula. Hope all is well.. have all these postcards to send to your parents, but just don’t seem to get to the PO.. hope you can share this blog w/Edna and Bennie…Send you and Marika(sp??) a big hug.. and see you next year.. me! Thank you for sharing your adventure! I look forward to the posts. We miss you all and envy your travels. aldous huxley said if the earth had two ends…well. labrador is hard, cold and alone. in winter,1961 i flew into a goose bay blizzard to refuel for next leg to idlewild on an icelandic air prop. your trip seems safe, beautiful and boring. you capture the essence. the feldspar minerals and the cold ocean currents say the rest. Thanks for reading!! Since I love to drive, boring at times those long roads bit great to listen to audio books.. Faulkner& Stegner! !